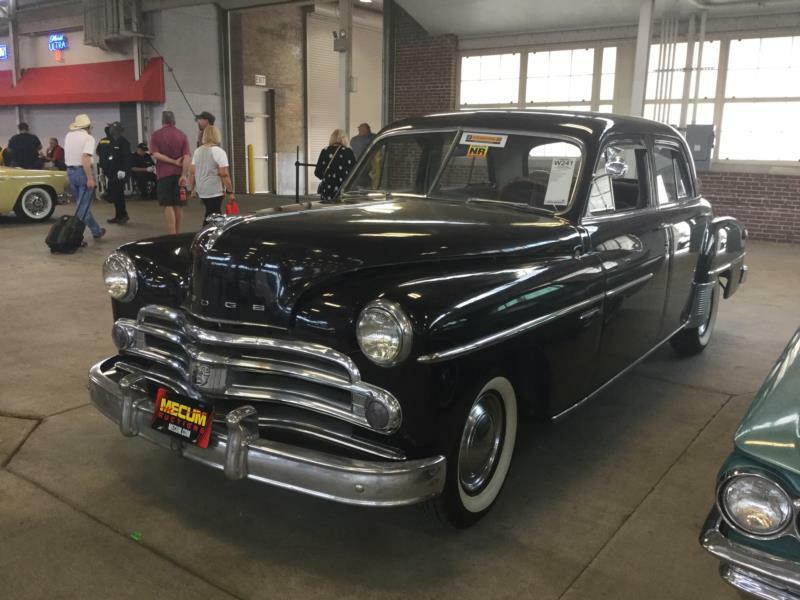 Dodge’s late introduction for 1949 had been eagerly anticipated by potential buyers since the 1949 Ford, Mercury, Chevrolet and Pontiac competitors were all-new as well. The model name – Coronet – was new, and the cars were conservatively styled in line with what Chrysler’s chief executive KT Keller thought customers wanted. Dodge sold more cars than in 1948, which was good for 8th place in 1949, and managed to retain 7th place from 1950 through 1952. The cars were offered only with Dodge’s dependable 230 cid flathead six that developed as much as 103 hp against Pontiac’s 90 hp for their six and 104 hp from their inline eight. Dodge used high quality components often not found standard on competitors, including aluminum pistons, automatic choke, “floating power” engine mountings, and full-pressure lubrication of the engine and oil filter. Something new for Dodge was key-start. Dodges also utilized fluid coupling plus clutch standard shift. Because of the fluid coupling, and due to the extremely low first which was for mountain and hill use, most drivers started in second position and shifted into third for higher speeds (requiring the use of the clutch). The car, however, could be stopped without depressing the clutch, but this also means it was capable of ‘creeping’ forward like an automatic transmission car. Optional and new was the Gyro-Matic two-range (four-speed) semi-automatic transmission with fluid coupling and clutch. With the Gyro-Matic, which cost $95 extra, the clutch was required only to shift between low range, high range and into reverse. The shift lever control on the steering column mimicked “three on the tree” but without “first” gear position. Most of the new cars utilized a long 123.5” wheelbase, meaning the doors on four-door cars were very large and made for easy entry and egress. The cars featured a very rigid double channel frame, independent front coil suspension, inclined rear telescopic dampers, safety rim wheels, and dual front brake cylinders in the drum brakes providing extra resistance to fade. An 8-passenger sedan utilized a long 137.5” wheelbase, with two folding jump-seats in the huge rear compartment. Dodge station wagons were all-steel, but had wood trim at first. Other body styles included club coupe, convertible coupe, two lengths of four door sedan and Diplomat hardtop coupe. Prices of the upper class Dodge Coronet line started at $1,914 for the club coupe, maxing out at $2,865 for the 9-passenger station wagon, of which only 800 were built in 1949. The 1950 cars were largely carried over with new touches including grille. The wood-grained instrument panel carried on as before with three square dials in front of the driver and optional clock between the optional radio and glovebox. The 1951 cars were extensively restyled and had a new grille and an entirely new instrument panel with one large circular speedometer flanked by smaller oblong instruments. The news from Dodge for 1952 was much the same, as there were all-new cars and an all-new V-8 for 1953.